Like other Visual Quickstart Guides, the version for iPhoto '09 is not a manual but a detailed and complete how-to guide. Instead of covering every feature, the book covers those features you'd be most interested in, and the author doesn't disappoint. Rather than answering the question "What does this do? ", the book answers the questions about "How do I do this?" The book covers the following topics in detail in a logic progression of how a new user would approach the topic, and features chapters on installation, importing and managing photos, working with the Faces and Places feature, slideshows, editing, publishing, and printing photos. As a bonus, the book also contains a great appendix on photography techniques to make anyone a better photographer. Within each topic, details are covered one page at a time with copious screenshots (hence the Visual part of the title) making for a quick read without too much fluff and superfluous information (the Quickstart part of the title). Engst's excellent writing style enabled even the more complex topics to be succinctly and deftly handled in just a few paragraphs. Personally I've always had problems getting pictures to print correctly on photo paper and after reading the short page on Printing Standard Prints and the Troubleshooting guide, I realised what I was doing wrong and no longer have a stack for recycling each time I want a simple 4x6. The Troubleshooting chapter in particular is an outstanding guide on figuring out what to do when iPhoto acts quirky. It helps you with those functions that should work, but due to current bugs in iPhoto, don't. You won't find this detailed guide anywhere, so serious iPhoto users should buy it for this reason alone!. 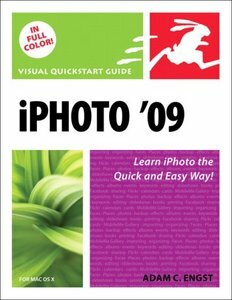 Although I consider myself an intermediate iPhoto user, I still found quite a bit of value from this book. I clearly don't use the full potential of iPhoto, and know more about how to use certain functions to my advantage rather than learning for the sake of learning. Both beginner and intermediate users will find just what they need in this book. Rarely can a book walk that line of not talking down to intermediate users and not talking over the heads of a beginning users. Here is proof you can do both. Pros: Covers the most useful topics within iPhoto in a quick easy to understand format with great tips and tricks along they way. Throughout history various philosophers and scientists have envisioned a goal, yet have never been able to achieve it. Early on we had the alchemists who tried to turn lead into gold; in the last century physicists tried to create cold fusion, and more recently have been trying to prove the existence of the Higgs boson. Likewise, mankind has tried for ages to create screen protectors that are bubble free. Science simply has been unable to achieve a bubble free applied screen protector....until now. If I hadn't done it with my own two hands and seen it with my own two eyes I would not have believed it. On my first try with only a light wiping of the screen, my iVisor applied without a hitch. Zero bubbles, zero distortion, and zero glare. The screen looked so much better without the glare or fingerprints of the original iPad screen. The touch screen was just as responsive as before. My concern about the laws of physics, however, was immediately challenged. The next morning the sun did come up, gravity was still working yet my iPad screen was still protected and was fingerprint and bubble free. After getting a bit of grease on the screen, I was able to remove the protector, clean it, and reapply the iVisor again without bubbles. Overall, the iVisor is the best screen protector I've ever seen for any device. Not only does it protect the screen and reduce glare, the zero-bubble feature is simply amazing and isn't science-fiction but science fact. After using the iVisor, I can't imagine ever dealing with the hassles of the average screen protector. I can't wait until they come out with this for the iPhone and the iPods! I think I'm going to revisit that whole lead-gold thing again, because thanks to Moshi I believe anything is now possible. While many people can do occasional typing on the iPad or iPhone via the virtual keyboard, serious keyboarding simply isn't possible without a true external keyboard. While Apple offers two options, they are limiting and the Matias Folding Keyboard provides an ideal third option for serious iPad typists. Before I got the Matias Folding Keyboard, I used the Apple Bluetooth Keyboard and the Apple iPad Dock with Keyboard. I immediately disliked the iPad Dock. It required me to remove my iPad from it's protective case while docked and didn't allow me to change the angle of the iPad nor move the keyboard to a more comfortable and ergonomically ideal position for me. Of course, it wasn't as portable. The Apple Bluetooth keyboard was much better for me. My main complaint about it was that I didn't terribly like typing on it. The keyboard is physically small and the keys aren't as responsive. Additionally, when I'd do number crunching, I missed the 10-key pad of a traditional keyboard. Travelling with the Apple Bluetooth was better than the Dock, but the metal keyboard got hot in the car and the cylinder at the top of the keyboard didn't always fit in travel bags easily. 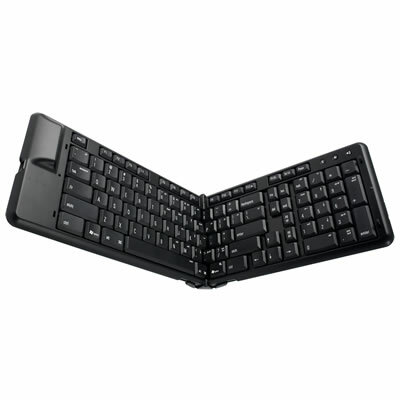 The Matias Folding Keyboard is an ideal compromise for the serious iPad typist. Unlike Apple's offerings, this is a full-sized keyboard. There are no tiny key caps designed to look good, but not to do heavy typing. This keyboard folds to about the overall size and thickness of the Apple Blutooth keyboard, but unfolds into a full keyboard complete with number pad and a spacious typing area. If you want to effectively type with an iPad, the Matias Folding Keyboard is an ideal combination of portability and function. You'll have a full sized keyboard that's compact and and a pleasure to type on. Cons: Could use some feet to make it a bit more ergonomic. The name Otterbox is synonymous with quality protection for your portable devices, so having a line of cases for the iPad is a welcome addition to their family. Generally, Otterbox cases come in the "Defender" line and the "Commuter" line. While the Defender is the ultimate in protection, the Commuter is an excellent balance of price, performance and bulk. The Otterbox Commuter for the iPad is similar to Commuter products down the Otterbox product line. It combines a silicone wraparound with a hard plastic support and a plastic screen overlay: three different forms of protection for your iPad when most vendors provide only one. The Commuter added a slight bit of bulk to the side and back of the iPad, but was within the normal dimensions of other silicone cases. I was easily able to fit it in most iPad sleeves. Given the large size of the iPad, a structural support in back is important to prevent screen cracking due to flexing. The Commuter's combination of matte makes the case much easier to grab and much less likely to slip out of your fingers. Holding my iPad in this case was comfortable and natural. Unlike other silicone cases that didn't quite fit, the Otterbox always has a tight custom fit. I'm a big fan of the Defender Case, but not everyone wants that level of protection (or price tag). 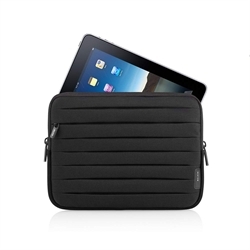 For those looking for the perfect balance of price, style, and protection, the Otterbox Commuter for iPad delivers! Weighing in at over 3 pounds and close to 900 pages, this book isn't just the missing manual, but the definitive guide to everything Snow Leopard. If it isn't in there, you probably don't need to know it. Seriously, though, this is a great guide and each time Pogue comes up with a new edition of his Mac OS Missing Manuals, they just keep getting better and better. Similar to previous editions, the author takes you through every aspect of the operating system and the included applications and even some of the iLife apps. Menu commands, their functions, and their relation to real world situations is a hallmark of the Missing Manual series. Screen shots are used where appropriate but not so many that you feel like you are reading a comic book. Of course, sprinkled throughout the book are tips, tricks, and "nostalgic corners" telling us how we got to this 6th generation of Mac OS X. Unlike previous editions of the book, the author is including more of the intermediate users in his mix. Many more advanced topics aren't just mentioned, but clearly explained. In particular, the book explains the difference between Applescript and Automator and how to write practical scripts and workflows the average user would benefit from. Other more advanced topics include Windows and Mac file sharing (especially the problems Windows 7 poses), virtual private networking, and top "useful" unix commands. 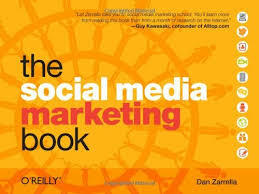 The book is designed to be a reference guide more than a how to or walkthrough book. The table of contents and index are indispensable tools for zeroing in on exactly the right command and program to get the job done. 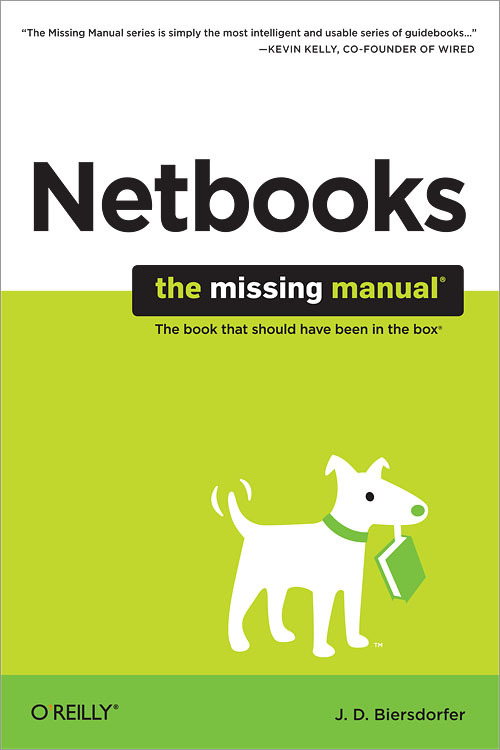 Every IT department and help desk should have a copy of this book. I've only been in a tank once. It was some museum in my childhood and I can't remember where, but it was impressive. When you were inside you couldn't hear anything from the outside world. You'd bang on it and your hand would hurt. It was an impressive vehicle that provided unbelievable protection from the outside. "Tank" is the first word I thought of when using my Otterbox Defender for the iPad. While I'm a big fan of the Defender for the iPhone, I was deeply concerned about my iPad. The iPad costs nearly twice as much and just seems so exposed with that big screen in the front. Would my trusted guardian angels in Fort Collins let me down? Absolutely not. Similar to most Otterbox Defender cases, the Defender for the iPad has two methods of protection. The core is made of hard plastic, which is particularly important on the iPad since you could flex it hard enough to crack the glass. Unfortunately, I've seen this in action. The second line of defense is a standard silicone overwrap. This silicone withstood sweat and oils without getting slick or discolored. The silicone protects most of the ports on the iPad such as the volume switch and the rotation lock. The dock connector is protected for daily use, but is accessible via a removable plate to allow the iPad to be plugged in for charging. Unlike the Defender for the iPhone, the Defender for the iPad does not have an integrated plastic screen shield built into the case. I was very disappointed because they included a standard plastic overlay instead. I hate those. After about 10 attempts of putting on the plastic overlay and pushing out the bubbles, I gave up entirely. I'm sure the engineering of such a large screen protector was difficult, but I did like the complete protection the integrated overlay offered for the phone version and wish it were available for the iPad version as well.. The Defender for the iPad had some unique features that more than made up for the lack of integrated screen protector. Because the screen is so vulnerable on the iPad, Otterbox included a hard plastic protector shield that completely encloses the front of the iPad and snaps into place with the rest of the case. But there's one more thing: this hard plastic also acts as an iPad stand in either horizontal or vertical mode. I've struggled with carrying a quality iPad stand while doing heavy typing and my prayers were answered by Otterbox's engineering department. Some may balk that the case has an $89 price tag or that it bulks up the iPad a bit, but like the solider in the field, sometimes you need that level of protection. It won't protect against everything, but for day-to-day mortals like me who take it everywhere around town, this is a reliable insurance policy to protect my iPad against mishaps. I love my iPad almost as much as my Defender for my iPad! Great job! In this blog post for TheAppleBlog, I cover food diaries and calorie counters for the iPad. Some great ones out there! I'm about the worst person at taking care of my car. I'm like the computer owner who never backs up, doesn't run an antivirus, and always unplugs the computer instead of doing a proper shutdown. I'm a mechanic's nightmare. However with CarMD ($98.00), at least I'm not a total n00b anymore in taking care of my car. CarMD takes advantage of the OBD (On-Board Diagnostics) port built into most cars made after 1996, which is usually located somewhere under the dash. The CarMD website tells you exactly where to find the port on your particular car. Once you find the port, all you have to do is plug it into your car and wait until the device beeps that it's read your car's info. Three simple lights give you a quick diagnostic of your car's status: a green checkmark indicating all is ok, an yellow question mark indicating there might be a problem and a red x indicating something needs to be corrected. The CarMD includes a USB cable and software to hook the device up to your computer. The software primarily creates a bridge between the device and the CarMD website. The first time you use the website, you have to put your car's information and mileage into the system. One account can support up to three different cars. I easily added my car and my spouse's. They suggest using the device when checking out a potential used car for purchase, but with only 3 cars on one account, the usefulness in this area is somewhat limited. The first time I tried the device, my car just had a major milestone of service, so I knew everything checked out ok. Ironically, my CarMD had an yellow light indicating a problem. I panicked and spoke with their support people. Apparently when you get your car serviced, certain logs are cleared out so there wasn't enough diagnostic info in some areas. Whew! A few weeks later the device had no problem giving my car a clean bill of health. In addition to explaining your "check engine" light on your car, the CarMD website also informs you of any recalls or technical service bulletins. For an additional $19.95 you can unlocked an unlimited number of these TSBs, or you can simply research them yourself. For an car dummy like me, it's best just to pay for the premium so you have all your car info in one place. In the future, CarMD promises the Premium Membership will include data about scheduled and preventative maintenance. Overall, I really liked the device. I panic when any strange lights come on my car or whenever I have a problem. For less than the cost of a shop visit, I can arm myself with enough information to make an informed decision about my car care. Hard Candy seem to always be first to market lately with protective cases for Apple's latest accessories. First impressions mean a lot and Hard Candy doesn't disappoint. Their Bubble Sleeve is the case I rely on for my iPad when I want to make sure it's gong to arrive at my destination intact. This case adds quite a bit of bulk to your iPad. Other sleeves can be compared to a sports car: svelte, stylish and fragile. The Bubble Sleeve is the mini-van of iPad cases and focuses on protection rather than style or size. It's the sleeve you'd carry your children to soccer practice in. Don't we all think of our iPads as a member of the family? Color options include black, gold, and pink. Externally, the Bubble Sleeve looks like bubble wrap. Round half globes give it an industrial look and provide the first level of protection for your precious. Inside, your iPad is cushioned with a firewall of soft foam rectangles. The sides of the Bubble Sleeve are reinforced with felt struts to provide additional protection on the endpoints. The back of the iPad is cushioned in a flat layer of foam protection combined with bright red shock absorbing rubber bumpers to hold your iPad in place. Overall, I found the Bubble Sleeve a bit bulky for everyday trips to the coffee shop. When traveling the protection was outstanding. I felt very comfortable that putting my Bubble Sleeve in my carry on or laptop bag would ensure my iPad arrived along with me intact and unscathed. Neoprene sleeves simply don't provide enough shock absorption for the bumps and drops the average traveller encounters. I've also used the Bubble Sleeve when carrying my iPad on my bicycle and recommend the Bubble Sleeve to students who ride to class. Those bubbles will protect your iPad from getting crushed by those heavy textbooks in your backpack. Here's a tip I wrote for TheAppleBlog I've long used to obscure information in plain sight in my address book. I've never done it with credit cards, but used it as an example. You just decided to upgrade your Macbook hard drive to take advantage of the incredible storage space out there now or maybe you are adventuresome and switched to a Solid State Drive. What should you do with the old hard drive? If you are looking for an easy, economical repurposing of that old hard drive, the OWC Express 2.0 enclosure is an excellent choice at $19.99. Unfortunately I've been burned figuratively and literally by inferior quality enclosures with questionable origin--my Mac Pro has the scorch marks on the USB port to attest to this fact. Luckily this enclosure comes from a company which stands behind their product and truly knows the Mac. Don't expect many bells and whistles on this unit. The case is made of plastic despite it's faux metal appearance. Nonetheless, the case is sturdy and has stood the test of time being a spare hard drive I keep in my laptop bag for large data transfers. Installation of the old drive into the case was simple: a few screws and you are done. Clear instructions were included as well as USB cable. Included additionally in the kit is a faux leather carrying case to match the faux metal case. The carrying case had little value because I couldn't easily carry the case and the USB cable. No big deal, but a little more attention to the design would have added significant value to the carrying case. Whether you are looking for a portable drive or an easy Time Machine backup, the OWC Express 2.0 is an inexpensive and reliable way to reuse an old SATA drive while sticking with Other World Computing's legendary quality. The "My New" series is designed for non-technical beginning users who need some hand-holding in confronting their new device. 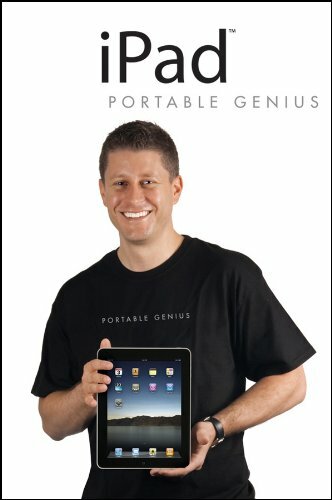 "My New iPad" is a perfect book for someone who has never used in iPad or iPhone and needs to be taught the very basics. Although the book claims intermediate users can learn tips and tricks, the book was too simplistic to be of any value to experienced users. For the beginning, readers will find just the information they need to get up and running. Although the book is a thick 350 or so pages, it's a very quick read and includes a large number of pictures for reference purposes and learning about your iPad without actually having an iPad in front of you. Instead of focusing on every feature, the book covers those features the average new user would be interested in. The books starts at the beginning: how to turn the iPad off and on. Instead of a list of every feature of every setting in alphabetical order, the presentation is based on how a user first approaches their iPad. First they turn it on, then customize it, then they get on the Internet and go from there. The last chapters focus on more advanced topics such as moving Microsoft Office docs to and from your iPad and suggested apps (although the app suggestions are extremely outdated). In the middle is a focus on practical aspects of iPad use - less about what an app does, and more how to integrate that app into your daily usage. Overall, this book is great for a beginner to the iOS platform as well as the iPad user who bought one and quite can't figure out the best way to use it. It's a legitimate question and one that plagued me since I got my iPad and had to wait until I got home to activate and use it. This heavily commented article was featured on TheAppleBlog. This very popular post about how to use an old iPhone with a prepaid plan for both minutes AND data proved very popular. Not only was it originally written for TheAppleBlog, but LifeHacker also run the story. This review of Quickbooks 2010 for Macintosh has appeared various places. Apple recently updated their backup software included with MobileMe subscriptions. This version is significantly faster and more reliable, but time will tell. I wrote this article about my initial first impressions for TheAppleBlog. Lingering iPad Question: Who Gets to Sell it? In this post, I examine the question of who will get to sell the iPad. I made some predictions as to whom besides Apple will sell it. Apple said "select" Apple Specialists, but didn't indicate which ones. Unboxing video: Who didn't do one of these. I met the UPS guy at the depot so I could be one of the first. Walkthrough: Initial iPad Setup: a detailed step by step guide on setting up the iPad. Whew. April 3rd was a busy day for me! Welcome back everyone. The move from FTP publishing from blogger was harder than I thought! We've had some back end changes! Robin Williams has done it again! Another outstanding book for a new user of Snow Leopard and the Mac. Robin's style is to expertly use page layout and screenshots to explain the features of an operating system in small bites everyone can digest. I enjoy the fact she doesn't talk down to her readers. She expects a basic understanding of how to use a mouse and keyboard. This book is designed for a Mac or even a PC user making the transition to Snow Leopard, either via upgrade or by the fact it came with the Mac. She walks the reader through all the features of Snow Leopard. 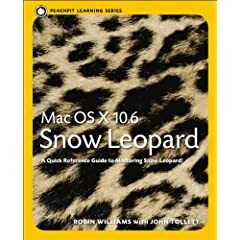 Williams apologizes for not covering the iLife or iWork suites, but clearly points out this is a book on Snow Leopard. I'm sure she realizes that if the book were too big, readers would be intimidated. While it's over 450 pages, she uses a great table of contents and index to allow the reader to hone in on the info they are interested in. Want to know how to do screen sharing...no problem? Just like Snow Leopard, I noticed a few "tweaks" in this book that made it even better than her Leopard edition. The screen shots seem to be better annotated as compared to last time and the book seems even easier to read. The table of contents is organized into three main sections: "Mac OS X Basics for new Mac users", "Mac OS X Applications in Snow Leopard", "Make it your Mac" and "Tech Stuff". This allows the reader to focus on just what matters to them. She clearly spent lots of time making sure her book was extremely user friendly, just like the operating systems she covers. Not only does she cover practically all the features of Snow Leopard, but Williams includes great troubleshooting advice for when things go wrong. The advice she gives is as good or better than what you'll get on the phone calling tech support or stopping by the "bar." If her troubleshooting section doesn't cover it, you'll need a technician to come out! My one complaint is that the author should have marked those features new or different in Snow Leopard. Doing so would allow an upgrader to focus on just those new items in Snow Leopard. This book is not intended for intermediate or advanced users. You won't find out which port to open for screen sharing or its inner workings--just how to initiate it. I compare her books to more "manual-like" books that cover every feature in depth. This book is designed to hold the readers hand through the process of learning. Pros: Outstanding layout and organization. Excellent descriptions for novice Mac users. Enthusiastically recommend it to all new Snow Leopard Mac Users. Use this book as a starting point in your learning!